Uprooted! Music and Movement Tuesdays and Thursdays, 10:30am **Attention: Due to lack of space in February, the sessions on Tuesday the 5th and 12th and cancelled. The sessions on Thursday the 7th and 14th will be located in the Kulick Center: 1201 Livernois St, Ferndale, MI 48220. Uprooted! Music and Movement will focus on small and gross motor skills, listening, playing, and having fun. These practices will aid in developing a confident learner when your child is ready to read. 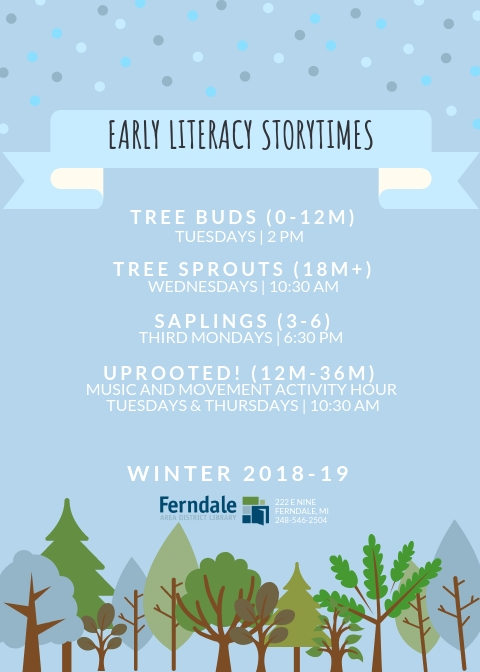 This class is open to ages 12m or walkers through 36m, and is especially great for wiggle worms who may not be able to sit though a whole book. The Tuesday and Thursday sessions each week are identical. This is due to the program's popularity, in hopes that the crowd will spread out so that children will have room to move again!